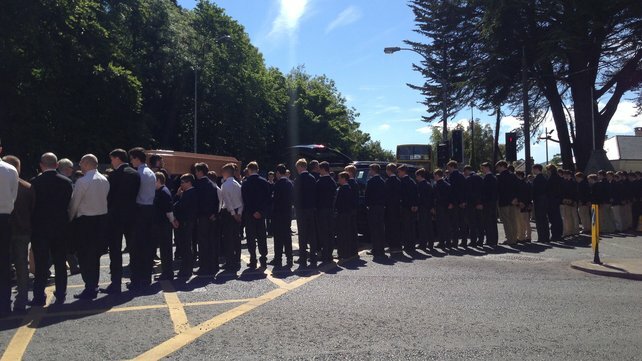 Bishop Brendan Leahy of Limerick has said that while the grief for the families and friends of those who died in the Berkeley tragedy is “unspeakable”, the sense of solidarity across Ireland and beyond, and particularly from the young, is hopefully shining through for them in these darkest hours. In his homily at the Limerick Diocesan Pilgrimage Mass at the Lourdes Grotto on Monday, Bishop Leahy said it has been a shattering week for the bereaved families but he hoped they could take comfort from the enormous outpouring of support in response to the terrible tragedy in California. He said the coming together of the nation and particularly the response of the youth this past week had been a “triumph of human spirit”. “I thought initially following this horrific accident, how would the families of these beautiful young people who died in the accident be carried through this unimaginable tragedy,” he revealed to over 370 Limerick pilgrims. “Collectively our country has had a moment to stand together with them and strive to carry them through and the first to rise with them have been the young, the friends of the young people killed so tragically and, indeed, thousands of others from across the country who never knew them. At 11am on Tuesday, the funeral Mass for Eoghan Culligan took place at the Church of the Annunciation in Rathfanham, Dublin. The chief celebrant and preacher was Fr Richard Olin CSSp of St Mary’s College in Rathmines, where Eoghan attended school. A guard of honour stood outside the gates of the church before and after the funeral Mass formed by students from St Mary’s College and members of the Ballyboden GAA club, where Eoghan played football. The funeral was attended by the Aide de Camp to President Michael D Higgins, Lieutenant Colonel Kiernan and the Aide de Camp to the Taoiseach, Commandant Foley, as well as the US Ambassador Kevin O’Malley and Minister Alex White. Separately, Eimear Walsh’s funeral took place at the Church of Our Lady of Perpetual Succour in Foxrock. Fr Paul Ward, Parish Priest of Bayside, was the chief celebrant. He told mourners that the death of a young person is very difficult as it raises questions that cannot be answered, it challenges the very meaning and purpose of life. The chief mourners were Eimear’s parents, Jim and Patricia, and her brother, Robert. Jim Walsh told the packed church that she was a “beautiful person”. Minister for Arts, Heritage and the Gaeltacht Heather Humphreys attended the funeral Mass and the US embassy was represented by Stuart Dwyer, deputy chief of mission. The funerals of Olivia Burke and Niccolai Schuster will take place in Foxrock and Rathgar tomorrow, while Lorcan Miller’s funeral will take place on Thursday at Rathmichael Parish Church in Shankill.